Presenter, Workshops in Critical Thinking, Coordinated Science, Classroom Techniques, Questioning Strategies, Closure, Assessment, Kinesthetic Activities, and Learning Centers for teachers of all levels, National Science Teachers Association Conventions, National Association of Biology Teachers Convention, California State Science Teachers Association Convention, San Diego Science Educators Association Convention, Association of Christian Schools International Conference. This is one of the few photos I have of me as a presenter. I’ll be posting a gallery of products soon. In the meantime, visit my store at Teachers Pay Teachers for a selection of 27 products including some FREE items. Keep scrolling! For quotes on professional development workshops and training sessions email me at eit.drd@gmail.com. • “A is for Analogy." – Describes, supports, and illustrates the use of teacher-generated and student generated analogies in the presentation of content material. • Classroom Management Strategies for the High School Science Class – Session objectives are to provide concrete strategies and processes to help new/novice science teachers include more laboratory experiences in their courses. • "From Dead Fish to Forensics - A model for developing and implementing an integrated science program." & "Making Connections - A model integrated science program." - Describes development and implementation of four core semesters and two elective semesters of integrated science for 9th-12th grade students. • It’s Late at the Estate – Describes how to incorporate creative writing activities into science classes to teach investigative skills. • Kinesthetic is Kool – Demonstrates and explains four different kinesthetic life science activities. Participants “do” one complete activity. • Learning Centers in 60 Minutes? I don't believe it! – Focuses on constructing and using learning centers in elementary classrooms by providing samples and examples. • Pedagogical Alchemy & What Do You Do If Betty Crocker Wrote Your Lab Book - Describes how to move laboratory activities from “cookbook” style toward inquiry style—steps in the process of developing open-ended labs are discussed. • PReP (Peer Review Process) Your Classes – By participating in several examples of peer review and learning how to modify existing assignments to allow for this process with students, participants learn the power of this procedure. • Science at “C” Level: A Creative, Cooperative, Cross-disciplinary Approach to Critical Thinking & Stylin’ in Science - Participants are introduced to a method of teaching critical thinking skills incorporating creativity and cooperative learning strategies in a series of cross-disciplinary exercises designed to reach a wide-variety of learning styles. 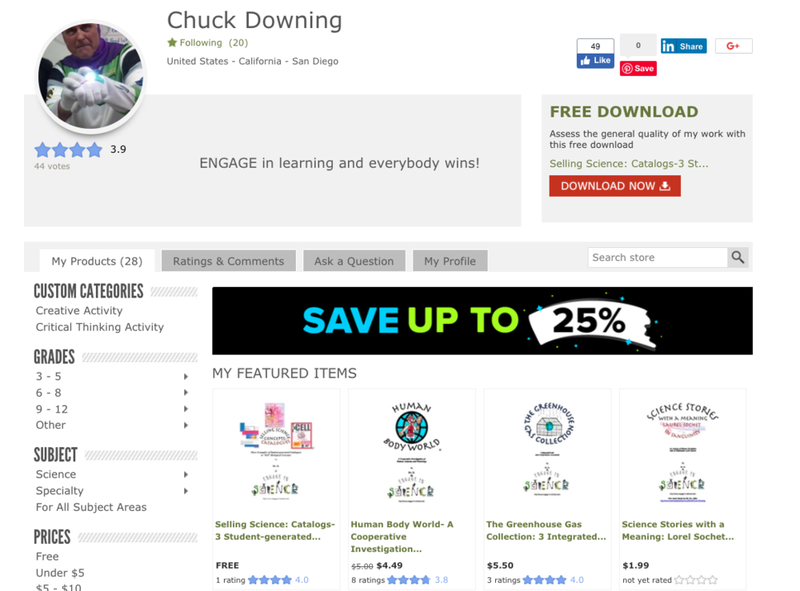 • Standards Based Science Portfolios – Discusses the process Great Oak High School is pursuing in determining if students meet academic standards. • THE END: How to add closure to your student learning experiences - Sample closure activities for single class assignments, long-term assignments and units of study, semester, year, and course sequence are described and demonstrated. • They've inquired, now how do I know what they know? - Participants experience a portion of an inquiry lab, discuss what might have been learned by students through the experience, and learn to create rubrics for several types of learnings which might have resulted from the lab experience. • Tricks from an Old Dog - Shared strategies and techniques gleaned and developed during 39 years of science teaching, including grouping strategies, time-saving techniques, and management ideas. • Tune up Your Teaching & “Open-ended questions are fine for some students, but mine can’t do them” - Focuses on questioning strategies: specifically how to change classroom questions from closed-ended to open-ended while teaching students the skills and techniques required to answer higher-level questions. Six innovative laboratory and kinesthetic activities marketed by Science Kit and Ward’s Biological Supply. Two-volume set of Cranial Creations, co-authored with both Owen Miller and Candace Aguirre, were best sellers for J. Weston Walch, Publishers. Co-author of AP* Biology Inquiry-Based Laboratory Investigations and Activities with Linda Morris. 27 laboratory and creative/critical thinking activities at Teachers Pay Teachers.